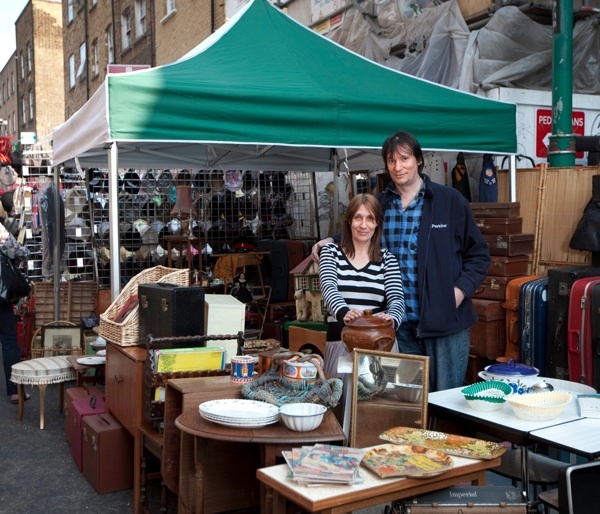 This is Andrew who, with his partner Maria, has been running this stall at the Shoreditch end of Sclater St selling cut price DVDs and training shoes for twenty -three years, and making a quiet living out of it. “Twenty-five years ago, we came to look around and decided to set up a stall,” he told me, exaggerating his consonants to be heard over the blaring music that advertises the existence of his pitch. 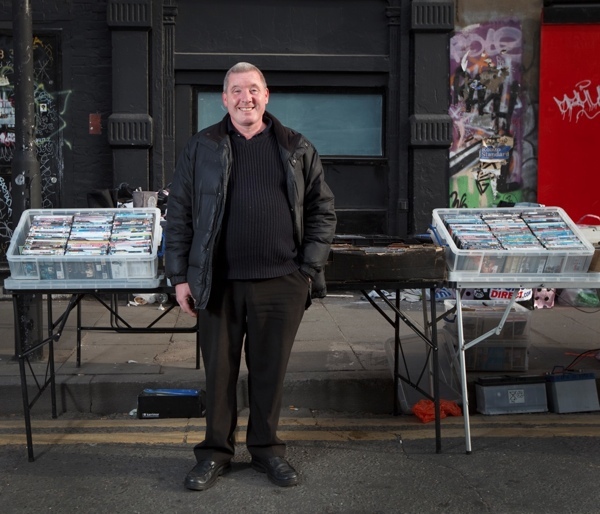 A modest figure, standing to the rear in dark clothes against a black wall, Andrew is almost invisible behind the barrage of sound and the noisy customers riffling through his DVDs, yet he has an ideal vantage point upon the market. “It’s got more yuppified,” he admitted, observing the change in the neighbourhood, “But it helps us – especially the younger ones with money to spend.” A noble example of the resilience of the street traders, Andrew is phlegmatic in the face of the big buildings springing up around him to overshadow the market. Emily has a keen sense of the drama of Brick Lane, both its joy and turbulence. “I love all this,” she confessed open-heartedly, gesturing around to her stock, “I only buy things I love, so I like it when people appreciate something and I know it’s going to a good home.” Emily spends all week collecting the small pieces of furniture, luggage, crockery, mirrors and household things that she brings here each Sunday but, in such busy location, she can hardly keep an eye on everything -“Mike comes to help me and make sure I don’t get robbed.” she admitted candidly.“We get up at six thirty and we come, rain or shine. In the Winter, we were scraping the snow off the pitch before we set up.” Emily continued with a equivocal smile, revealing the tenacity and strength of character it takes to be a trader on Brick Lane. “I am from a land where everyone’s very relaxed,” declared Albert enigmatically from beneath his green felt hat, when I went along to have chat at seven o’clock, after all the other traders had gone and his stall remained alone upon the empty yard, while Ernest Ranglin’s mellow jazz drifted off down Sclater St. Albert was speaking of his distant homeland of Vojvodina, but nowadays he drives to Spitalfields every week from Sheffield in his van full of curiosities. “There is a guy who comes each week to chat, he says, ‘I can’t afford to buy anything but I like your music’” Albert revealed to me, cherishing the delicate compliment. “I used to do lots of things, I’m a furniture maker and I used to be teacher of geography – I like challenges,” he confided with gentle melancholic irony, whilst presiding upon the square of tables that defines his personal oasis of thoughtfulness. 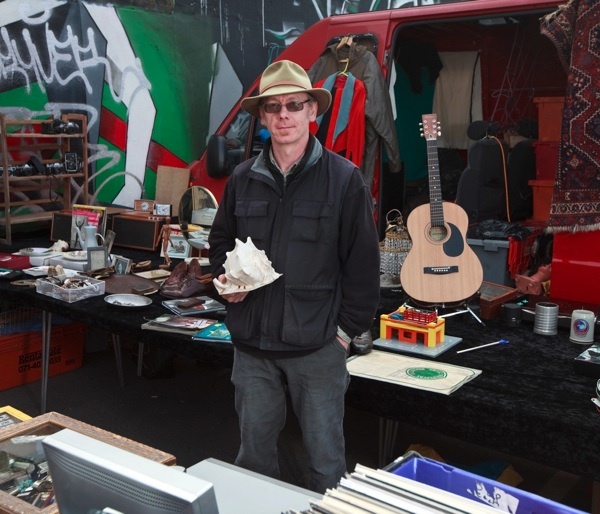 Albert is the philosopher of Sclater St market, who can always be relied upon to turn up intriguing finds, whether old cameras, photographs, tools, records, musical instruments, carpets, hats – or almost anything else you care to imagine – and accompanies them with superlative absurdist patter.